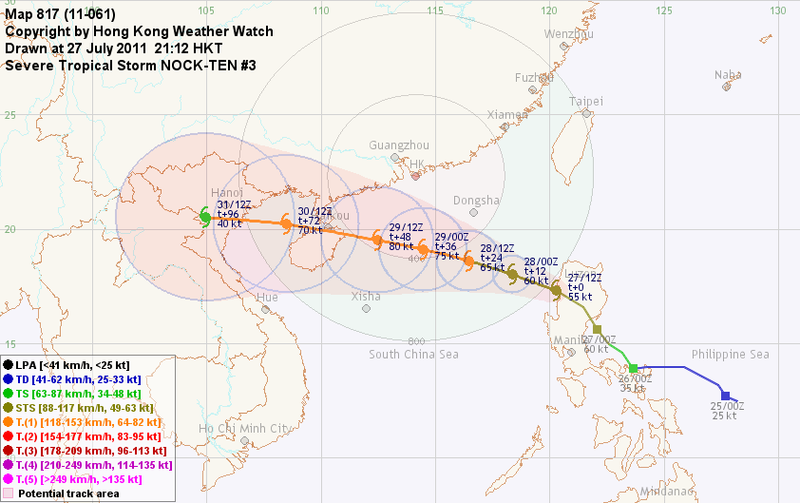 NOCK-TEN has made its final landfall in northern Vietnam. At 20 HKT, NOCK-TEN was centred about 210 km (110 NM) SSW of Hanoi. NOCK-TEN is the 118th name in the tropical cyclone name list. It was contributed by Laos, meaning bird. This name was last used in 2004. NOCK-TEN will continue to be steered by a ridge in China towards the west. NOCK-TEN will weaken rapidly inland, and will dissipate in about 24 hours' time. This is the final bulletin on NOCK-TEN. 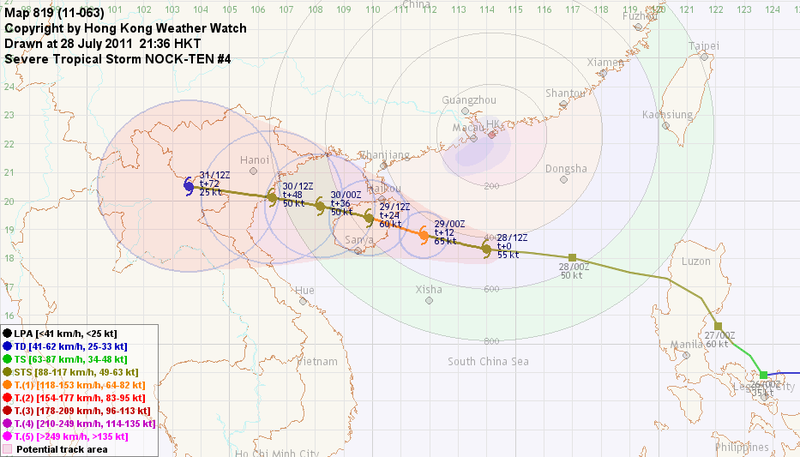 NOCK-TEN has made landfall at Hainan Island. 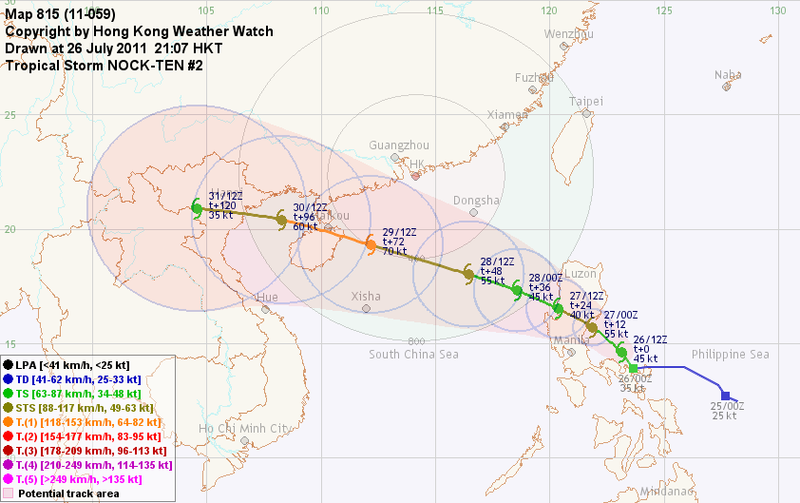 At 20 HKT, NOCK-TEN was centred about 510 km (270 NM) WSW of Hong Kong. The Strong Wind Signal was replaced by the Standby Signal at 14:10 HKT, which was cancelled at 16:40 HKT. NOCK-TEN will continue to be steered by a ridge in China towards the west into the Gulf of Tonkin. NOCK-TEN failed to intensify before landfall, remaining as a severe tropical storm. Land interaction will limit NOCK-TEN's strength, and it is expected to maintain intensity while crossing the Gulf of Tonkin. Rapid weakening follows as it makes its final landfall in northern Vietnam. Unstable weather associated with NOCK-TEN will continue to affect Hong Kong on Saturday. NOCK-TEN turned west and accelerated last night. At 20 HKT, NOCK-TEN was centred about 450 km (240 NM) S of Hong Kong. 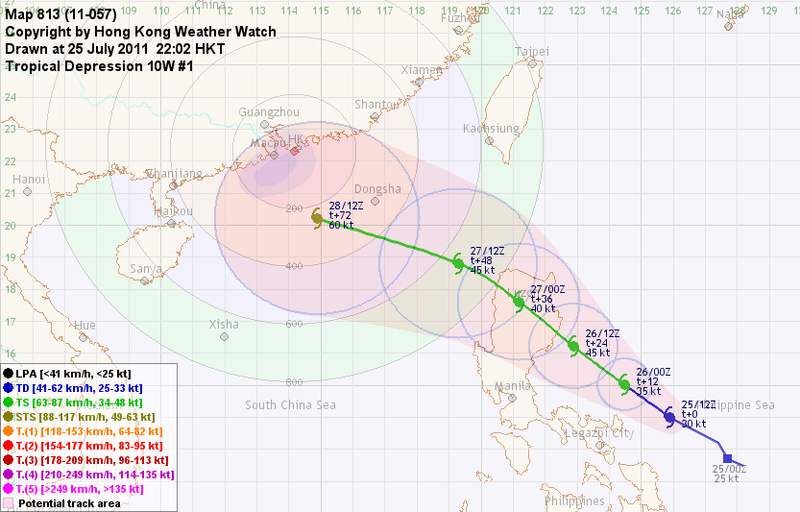 The Standby Signal was issued at 08:40 HKT and was replaced by the Strong Wind Signal at 18:45 HKT. NOCK-TEN is now in the southern periphery of a western extension of the subtropical ridge. 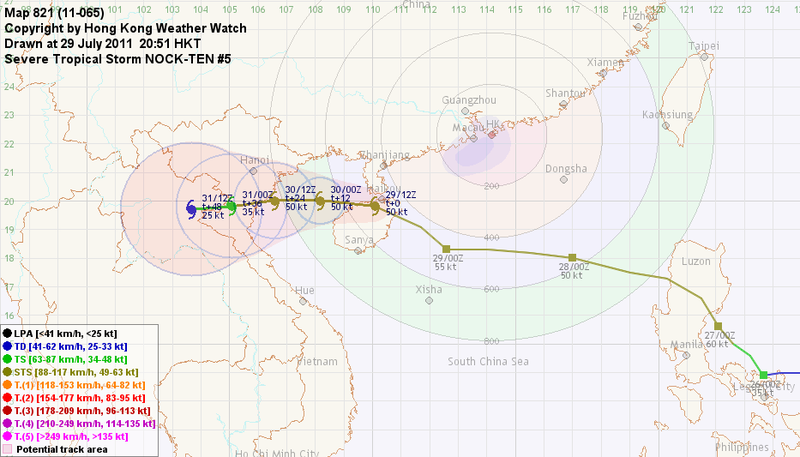 Under its influence NOCK-TEN is expected to travel W to WNW towards Hainan Island. NOCK-TEN's structure was damaged as it crossed land yesterday. Spiraling features become more prominent tonight. 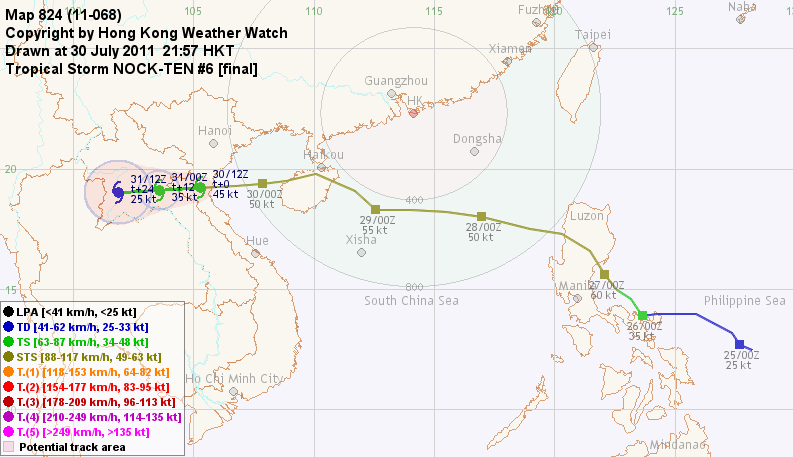 NOCK-TEN is expected to intensify until it makes landfall at Hainan Island. Strong easterly winds are now being observed in offshore waters and on high ground. Winds will intensify as NOCK-TEN gathers strength, and wind direction will turn to SE tomorrow. There will also be some squally showers. NOCK-TEN made landfall at Luzon today, and is now entering South China Sea. At 20 HKT, NOCK-TEN was centred about 850 km (460 NM) SE of Hong Kong. The subtropical ridge NE of NOCK-TEN weakens today, allowing the storm to move NW. As NOCK-TEN enters South China Sea it will be steered by the ridge in China, causing the storm to move WNW. NOCK-TEN was developing a banding eye as it made landfall. The mountainous Luzon caused it to lose some strength, but banding features are still prominent. As NOCK-TEN enters a pool of warm water, intensification will resume. NOCK-TEN is expected to reach typhoon strength as it crosses the South China Sea. Winds will strengthen from the E/NE tomorrow with occasional showers later. Strong winds will prevail on Friday with winds gradually turning to SE. 10W has intensified into a tropical storm, and was named NOCK-TEN. At 20 HKT, NOCK-TEN was centred about 240 km (130 NM) E of Manila. The subtropical ridge is still firmly in place NE of NOCK-TEN. The storm is expected to move NW to WNW in the next 12 to 24 hours along the southwestern periphery of the ridge. As NOCK-TEN enters South China Sea, northward track component will diminish as it will then be steered by the continental ridge. NOCK-TEN's convective bands have tightened over the past 24 hours. It is expected that intensification into a severe tropical storm is likely before first landfall. Intensity should drop as NOCK-TEN crosses the mountainous Luzon, but will increase again once it enters the South China Sea. According to the present forecast track, winds will strengthen from the east on Thursday to Friday. Tropical disturbance 93W east of the Philippines has intensified into tropical depression 10W. At 20 HKT, 10W was centred about 530 km (290 NM) E of Manila. A subtropical ridge is situated NE of 10W. Under its influence 10W will travel NW or WNW towards northern Luzon. As 10W enters South China Sea, it will be steered WNW by the ridge centred in China. 10W's convections are concentrated in its western semicircle. It is expected that 10W will intensify into a tropical storm before landfall under favourable environment. Intensification will cease as it crosses the Philippines, and will resume as it re-enters waters. According to the present forecast track, winds will strengthen from the east on Thursday.